The persistence of the myth betrays a lack of understanding about how abuse works. Experts say there's no evidence that domestic violence rises over the holidays, although the season can be especially challenging for victims. 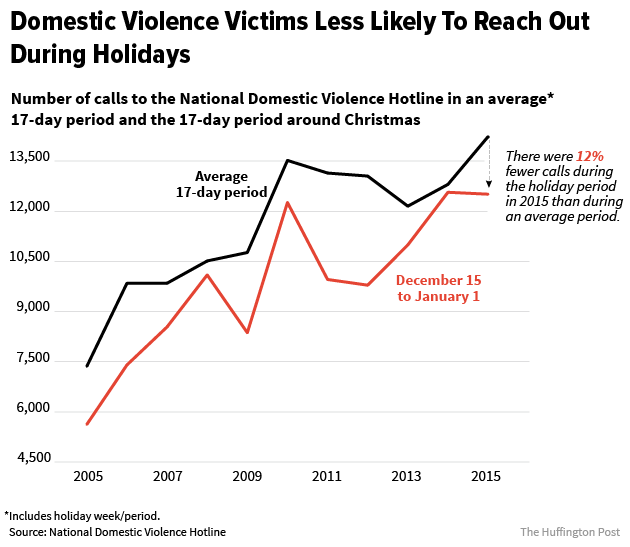 It’s a claim boldly asserted in local news stories each year: Domestic violence spikes during the holiday season. On the surface, the concept sounds plausible enough ― for many people, holidays are associated with family tension, crowded homes and copious amounts of alcohol. It follows that violence might increase under such stressful circumstances. Yet, domestic violence experts say there’s no evidence to back that up, according to interviews conducted by The Huffington Post. “This is a myth that has been debunked pretty well,” said Monica McLaughlin, deputy director of public policy at the National Network to End Domestic Violence. The center recently released a holiday toolkit to respond to the common misperception. The persistence of the myth betrays a lack of understanding about how abuse works, she said. Domestic violence is not simply isolated acts of physical violence, but rather a pattern of behavior. Perpetrators use a range of tactics ― including emotional, verbal, economic and sexual abuse ― to control and intimidate victims. She explained that while acts of physical violence may fluctuate in frequency over the course of a relationship, the power and control that underpins the abuse remains constant. McLaughlin said one reason the myth may persist is that the public can relate to the strain of the holidays and conclude that factors like stress and alcohol cause domestic violence. While they may exacerbate the situation, she stressed that they are not the root causes. Experts caution that it is difficult to accurately measure trends in domestic violence, as abuse often takes place behind closed doors and is severely unreported. What can be measured, though, is whether there is an increase in victims reaching out for help, either by calling the police or accessing support services. Victims may actually be less likely to reach out for help during the holidays, according to data from the National Domestic Violence Hotline, the country’s confidential, 24/7 helpline. For the past 10 years, the call volume on Thanksgiving, Christmas Eve, Christmas Day, New Year’s Eve and New Year’s Day was far lower than on an average day. In 2015, for example, the Hotline received an average of 837 calls a day. On Christmas Eve, that number dipped to 530, and on Christmas Day, there were only 450 calls. Over the 17-day period around Christmas in 2015, the Hotline received 12 percent fewer calls compared to an average 17-day period. Rachel Goldsmith, an administrator at Safe Horizon, New York City’s largest domestic violence shelter provider, said that her organization also sees fewer requests for help during the holidays. Domestic violence victims may feel societal pressure to keep their families intact around Christmas, she explained. Holidays are typically seen as a special time for celebrating families. Victims may feel guilty for not living up to cultural expectations, she said, and may try to stick it out a bit longer. Victims may decide to reach out after the holidays if the violence continues, Goldsmith said. But while there’s little evidence that domestic violence rises over the holidays, the season does pose specific challenges to victims and their families. Katie Ray-Jones, the CEO of the National Domestic Violence Hotline, shared a story of working in a shelter and talking to a little boy who was upset about leaving his dad’s house, where there was a big Christmas tree and lots of lights. “He asked me, ‘How is Santa going to find me now?’” she recalled. Shelters go to great lengths to make their spaces cozy and welcoming for families over the holidays, she said, but there are inevitably things that victims have to give up to attain safety. She urged the public to donate to domestic violence shelters and to think about what they can do to help victims over the holiday period.